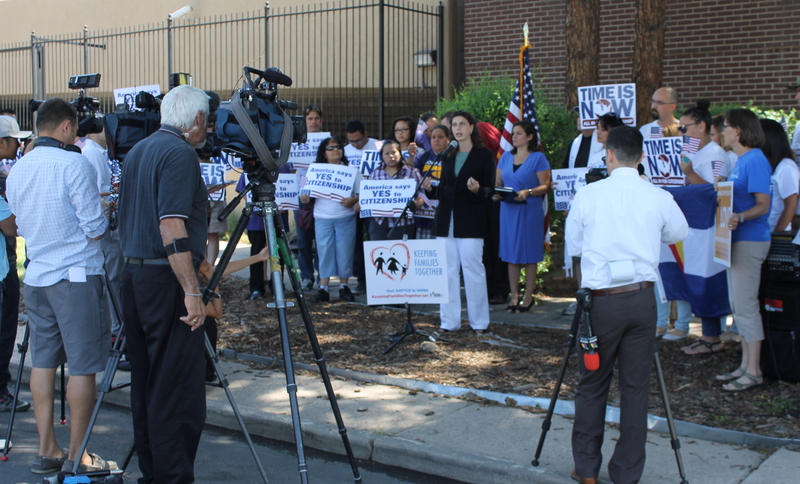 DENVER-Gathering outside of the Denver Republican Party headquarters today, representatives from eight Colorado immigrant advocacy organizations called for immigration reform that focuses on preventing family separation without additional border militarization. 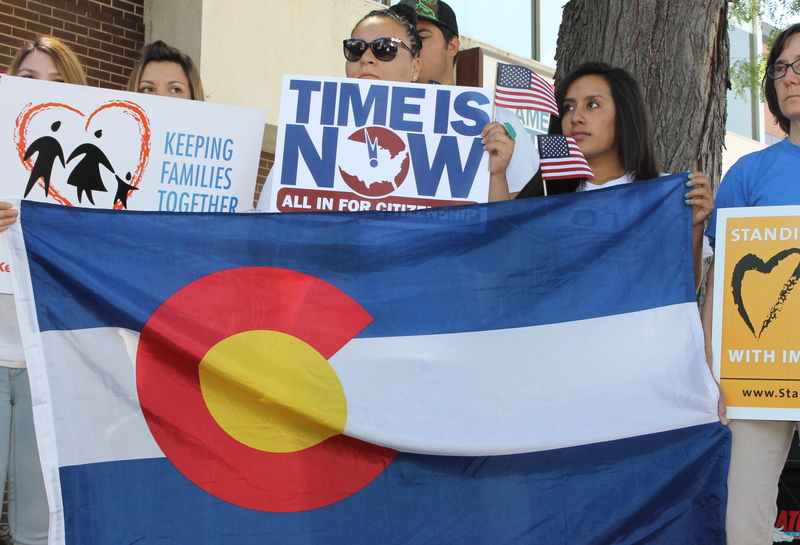 The speakers said that they wanted Republican Congressmen Mike Coffman, Cory Gardner, Doug Lamborn, and Scott Tipton to support comprehensive immigration reform that included a “reasonable” path to citizenship. 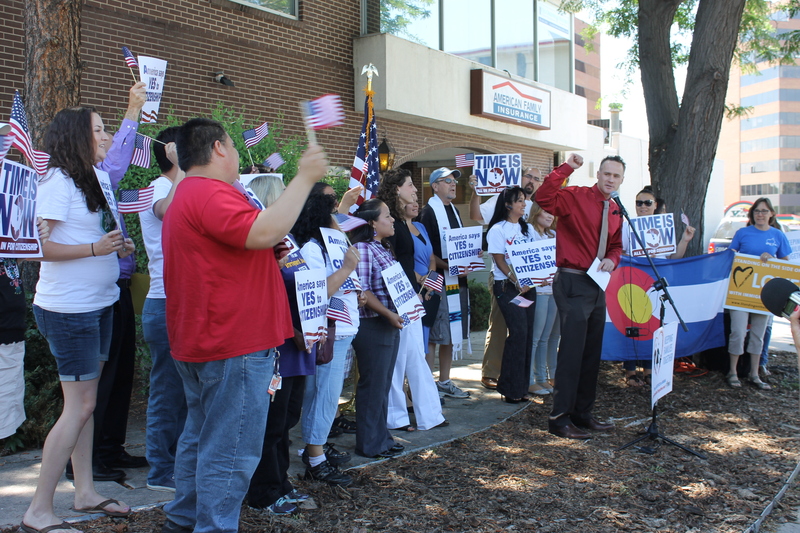 Civil and human rights groups, unions, and voting rights organizations rallied outside of the Denver Republican Party on July 2nd to call for humane immigration reform. It was just last Thursday that the Senate passed a federal immigration reform bill with bipartisan support with a vote of 68-32. On Thursday The Nation Report reported on border communities who oppose further militarization of the area which they said has led to increase death and violence against those who are attempting to enter this country through dangerous pathways in the deserts of Arizona. Border community members also cited civil rights violations against US citizens who live in those communities by US Border Patrol. The Nation Report has also reported on deaths which have been attributed to US Border Patrol by survivors of those living along the US/Mexico border. Within hours of the bill’s passage, border organizations paid tribute in Tucson to those who have been killed in recent years by US Border Patrol agents. In a Concept of Operations report released today by the nonprofit internet civil liberties group Electronic Frontier Foundations, information obtained through a Freedom of Information Act lawsuit described a 2010 report to Congress from US Customs and Border Protection (CBP) revealing the Agency’s heightened numbers of drone flights as well as plans to equip future drone flights with weapons. The EFF stated in the report that details such as flight locations, dates, and some agencies that use the Predator drones had been blacked out. 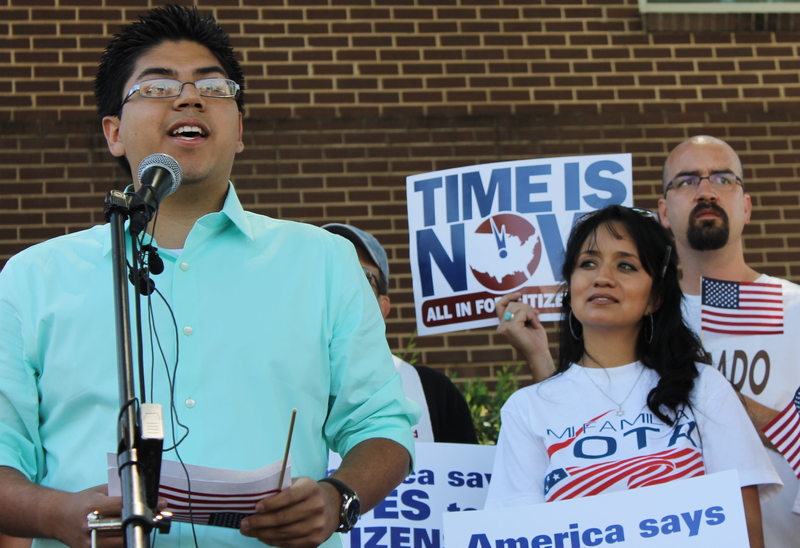 Julian Ross, Executive Director of the Colorado Immigrant Rights Coalition (at microphone) gestures to Victor Galvan, Civic Engagement Coordinator for the Colorado Immigrant Rights Coalition (left in red shirt). Targeted Colorado Representatives were Scott Tipton of District 3, Cory Gardner of District 4, Doug Lamborn of District 5, and Mike Coffman of the District 6–all Republicans. Representatives from immigrant rights groups say that at least two of these representatives have been avoiding them. 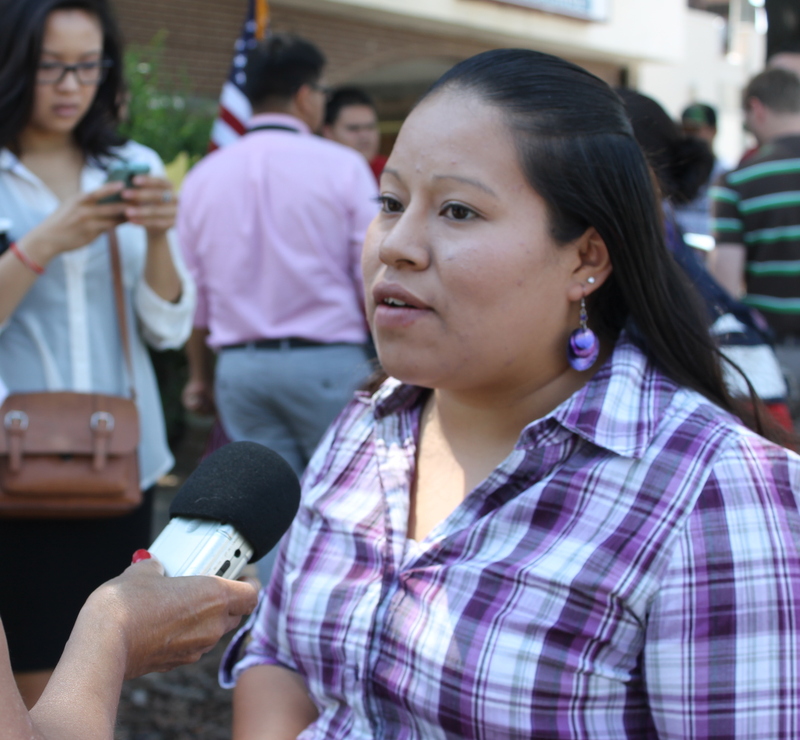 Sonia Marquez is a Co-coordinator for the Longmont group Latino Youth for Education and Equality. She attended Representative Cory Gardner’s March 27,2013 town hall meeting where she raised the issue of his meeting with immigrant rights groups, “Is there a possibility to have a one on one meeting with you where we can bring community together and start talking with you about some of these issues?” to which Representative Gardner responded, “I look forward to working with you and others who have some great ideas on this.” Marquez told The Nation Report today that she still has not been able to secure a meeting. This entry was posted in Civil Rights, Human Rights, Labor, Migration, Militarization, Police Brutality/Misconduct, Politics, Racial Profiling/Discrimination and tagged Colorado Immigrant Rights Coalition, Cory Gardner, immigrant rights, immigration, La Rasa, Latino Youth for Education and Equality, Mi Familia Vota, Mike Cofflan, Scott Lamborn, Scott Tipton. Bookmark the permalink.